Why do I need to keep learning the same lessons over and over again? Tonight I felt so completely overwhelmed with so many different aspects of my life. I've been here about a month and a half now, I'm all in. I'm not just testing the waters as a recent post-grad anymore. This is it. In utter exhaustion I came home from class, sat in my bathroom and cried terrific tears that I had been holding back for so long. 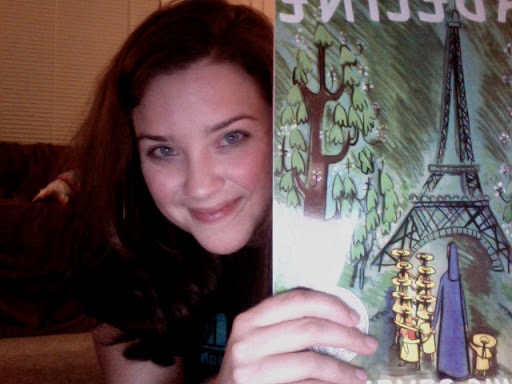 Then I went to Barne's and Noble and purchased a $7.99 paperback copy of my favorite childhood story, Madeline. I sat in the children's section despite the shady eyes I willingly received and read it. I decided that I couldn't part the store without it. After that, a cup of coffee, an oatmeal-rasin cookie (yum!) things were looking up. I went through my journal and stumbled upon words that I didn't even recognize as my own from Sept. 13th. How utterly sweet it is to be loved by you. I really think in the depth of my heart that I will be able to manage all of this. Through and by you. You are my Lord. You are my all in all in times of peace, in times of struggle. I thank you for the times of peace - but I also thank you for the struggles - because that is when I truly feel your presence. That is how I know your peace is real. Lord, YOU KNOW BEST and I surrender it all to you. Sometimes I forget that you know beter than I. After all, you are Lord. I am sorry that I get my priorities mixed sometimes. All the times. Every day. But, Lord you are sovereign. You are the famous one. And all this is for you. Know that I am yours and you are mine. Death shall not part us. c o m f o r t i n g .
It's like becoming familiar with a favorite childhood story. You fall right into where you where when your bright, curious eyes first looked upon the colorful illustrations. When you begged your Dad to read the story over and over again until you were safely asleep, floating on your dreams like bubbles riding breath. Hang in there BDub!! I love you and this too shall pass. Growing up is stressful, but you are super awesome, so show stress some class and brush it off girl!